I am broken. | wull hay. November 24, 2013 November 25, 2013 / rach. On Friday, I had to get some minor surgery to make sure all the scar tissue in my face is reacting as it should. They had to cut back into my face to clean everything out. They warned me there would be swelling and bruising, but in the end, hopefully, it would all be better. I don’t know if I should have, but I didn’t expect what happened on Friday at all: I crumbled. About four hours before my surgery, I broke down. And I could blame it on sleep deprivation, how crazy work has been, or how demanding school has been, but it wasn’t one thing, it was all of the things that my broken face represented. It was crying in HR’s office. It was forcing myself to eat something. It was a slightly snide comment from a co-worker that sent me to the bathroom to sob. It was shaking as I sent out an email about why I was leaving early. It was feeling weak. Feeling helpless. During the surgery, I was a mess. The drugs didn’t let me feel loopy (as they were supposed to) and I just cried and cried. When Evan asked me if I was okay, I said things like, “Does it matter? They’re just going to keep doing this to me either way,” in the tone you’d expect from a psychopath. It’s all over now. 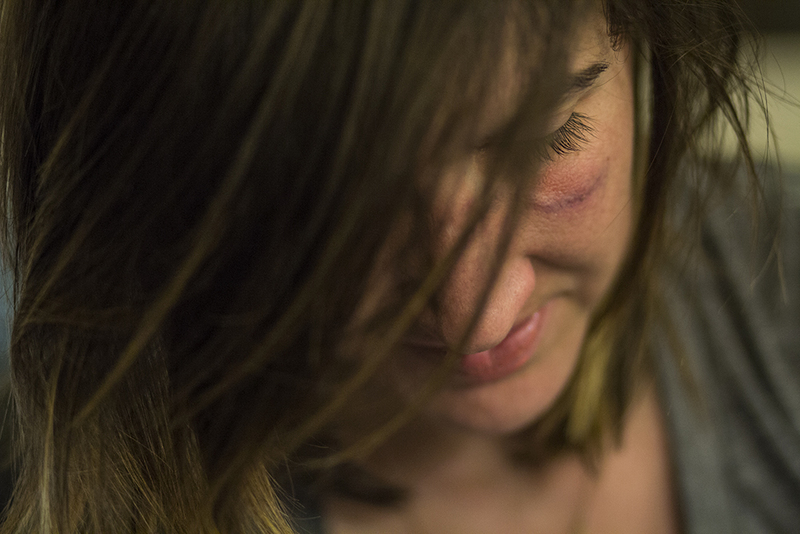 The bruise and swelling was much less than we all expected. The doctor didn’t even have to give me the stitches he thought he might. The pain is minimal and healing is already happening. Yet, yesterday, after catching my reflection in the mirror a couple times, I just cried more. And I’ve been thinking about why. Why am I such a mess? I constantly show people photos from after the accident with a sense of pride. Look what I went through. I chose to have this surgery. I knew everything would be okay. But I realized that since hours after getting home from the hospital back in January, I was trying to convince everyone around me that, despite my broken bones, I wasn’t broken. I was even trying to convince myself I wasn’t broken. And I’ve been doing that for ten months now. Going back to work immediately. Starting back at school full-time immediately. Meeting professors when I’m still in stitches. It’s nothing. I’m not broken. Climbing with Evan. Going on a huge bike trip with my momma. Taking on more responsibility. Fighting even harder for what I want. Things I believe in. And just when I thought I had convinced everyone, convinced myself, that I wasn’t broken… I had this surgery. It was an actual nightmare I’ve had over and over. I get up from laying down, look in the mirror, and my face it broken again. I can’t look at myself without seeing it, knowing it. My face is broken. Because I am broken. I am. I’ve always been broken. I wasn’t perfect before my skiing accident; I don’t know why I’ve been pushing myself to be perfect after it. This cut, this bruise, this scar… is me. It is the awesome imperfection, right on my face, that forces me to know that I’m broken. Perfection is an exhausting lie. This brokenness is beautiful. I am thankful. You are beautiful, inside and out, dear Rachel!